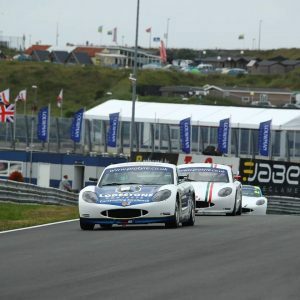 Alex made the trip to the Netherlands with his Richardson Racing team in confident mood, and eager to push towards the front of the highly-competitive grid during the series’ annual overseas meeting. Mixed weather conditions in qualifying would ultimately lead to Alex being an unrepresentative eleventh on the grid, with rival drivers who made the switch to slick tyres slightly earlier on a drying circuit managing to set quicker times just as the session drew to a close. Despite that, Alex fought back well when the lights went out, with a battling performance in race one enabling him to race through the field to take the chequered flag in sixth spot. Alex looked good to make further progress in race two, but his bid to secure a first podium finish of the year would be ended by an unfortunate puncture that forced him to make an unscheduled pit-stop. Despite the best efforts of the team to get him back on track as quickly as possible, Alex dropped off the lead lap and would finish the race down in 22nd place; a result that also meant he would start race three from the back of the grid. Once again however, Alex showed his overtaking prowess with a storming drive through to the fringes of the top ten before the race was taken behind the Safety Car because of an incident on track. Unable to make up further places as a result of the race being neutralised, Alex was left with a twelfth place finish to cap his weekend. “I really got my confidence back this weekend after a few tough meetings and I think I drove well,” he said. “It was unlucky in qualifying that we made the decision to switch tyres a lap too late as I couldn’t get the best out of the them and it meant we started race one from eleventh, but I was happy to then get up to P6 and felt confident that I could push for the podium in race two. “Sadly I picked up a puncture that meant I dropped off the lead lap, and it was particularly gutting because I was catching the cars ahead. It was fun to come through the field in race three and I was sure I could have got into the top ten had it not been for the incident that brought out the Safety Car late on. Big thank you to the team, my family Lodestone Projects and Proceed Group for your continued support couldn’t do this without you guys!